The latest polling in Iraq shows something interesting. Even while a large majority of Baghdad Shiites believe sectarian violence would increase after U.S. withdrawal, 80 percent across the country still want foreign forces out within a year. 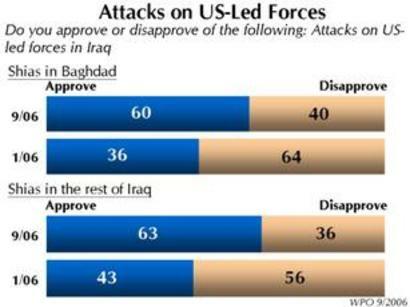 Moreover, clear Shiite majorities now support attacks on U.S. forces - up from around 40 percent support in January. The question is not, it seems to me, whether we redeploy our forces out of or within Iraq, but how and when.